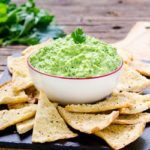 Creamy Cilantro Pea Dip is a snap to make in a food processor. Sweet peas, fresh cilantro, yogurt, and parmesan blended together make a delightful dip. Place all ingredients in a food processor fitted with a knife blade. Process until puréed, stopping to scrape down sides occasionally. Transfer mixture to a bowl. Cover and chill overnight. Serve with pita chips, crostini, or crackers.